Meerkats are fairly small mammals weighing about 1 kilogram each. Length from the head to the tip of the tail is about 50cms with the tail itself about 20cms long. Male and female meerkats are the same size. Meerkats have many tiny teeth which are mainly used for eating; occasionally they may be used defensively to snap at intruders.Unlike felines a meerkat is unable to retract its claws which are black and approximately 3 or 4 cm long. The claws on their front legs are mainly used for digging and the claws on their back legs are used for climbing. Habitat: Dry open country in southwestern Angola, Namibia, Botswana, and South Africa. 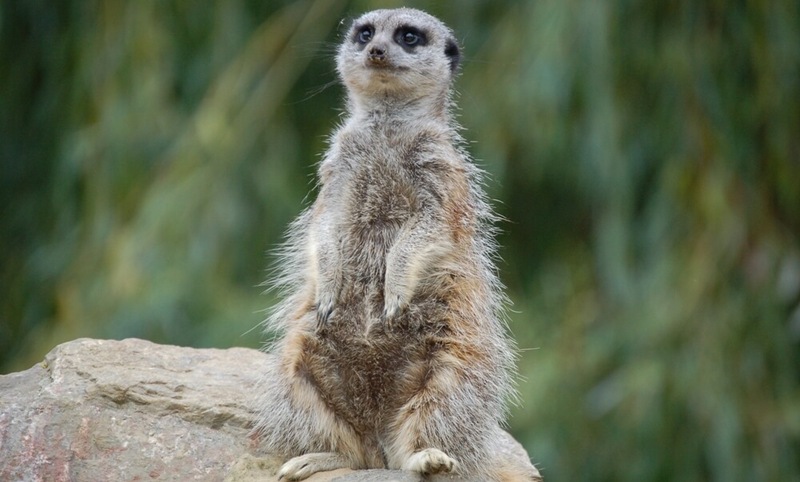 Meerkats live in underground burrows or rock crevices that can be as deep as 3 metres. Meerkats can dig their own burrows but often use burrows that have been dug by other animals. Population: Meerkats are not threatened in the wild. Lifespan: In the wild male and female meerkats usually live until they are about 10 years old. Diet: Meerkats will eat many things. In the wild they will mainly eat insects, small bugs like grubs or beetles, small mammals, scorpions, lizards, and some snakes. Meerkats have developed immunities to some animal poisons and venoms (meerkats are specifically immune to scorpion venom). Behaviour: Meerkats live in groups called either “colonies” or “mobs”. Each colony has up to 40 inhabitants but often many less. Each adult shares a variety of jobs but each has their own favourite. They are: Babysitter, Sentry, Hunter and Teacher. Once grown up meerkats like to remain in the same colony.